Indica/Sativa hybrid that’s easy to grow both indoors and outside. White Banner feminized cannabis seeds are a balanced 50/50 Indica-Sativa strain, comprised of White Widow and Bruce Banner genetics. Devoid of all male chromosomes, these female-only seeds are highly stable, generating a strong, vibrant plant and dense, potent buds. A perfect choice for growers of all levels of experience. This feminized strain’s easy-to-grow nature allows for both indoor and outdoor growing methods, requiring little experience to produce an abundant harvest. It’s hybrid genetics generate hardy plants that can handle slightly harsher conditions than many other strains. Flowering times are average, with the plants requiring between 8-10 weeks to completely ripen and mature. The buds are large and dense with a generous coating of resin, as you would expect from a White Widow hybrid, with potential yields of between 400-500 grams per square meter, depending on growing conditions and techniques. White Banner cannabis seeds are perfect for both recreational and medicinal cannabis growers, with a THC content of approximately 19%, it produces a cerebral high and calming, relaxed feeling. CBD levels of 0.12% make it a great source of natural pain relief, as well as reducing stress, tension and anxiety. Whether you’re new to growing cannabis, a seasoned grower, or a commercial ‘cash-cropper’, White Banner cannabis seeds will produce generous harvests of high quality buds, with a smooth, creamy flavor and long-lasting high. 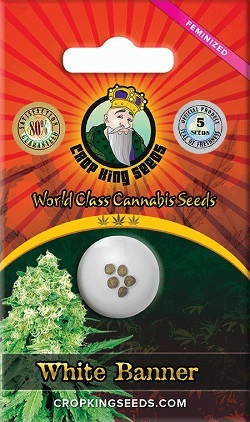 You can buy White Banner seeds in feminized packs of 5, 10 and 25 seeds, with bigger purchases enjoying huge discounts. All purchases are dispatched directly from Crop King, one of Canada’s leading cannabis seed producers and suppliers, with secure payment options and first-class customer care. Click below to learn more and buy White Banner feminized cannabis seeds. Buy White Banner Feminized Seeds today and receive fast discreet shipping to Canada and all US states.